The fully-equipped, state-of-the-art mobile health and dental center is made possible through a partnership of Gateway Community Action Partnership, CompleteCare Health Network and Inspira Health Network. The unit serves individuals and families of all ages, enabling them to access care and referral information for additional dental or medical services, as needed, in one location that is convenient to those most in need of services. The vehicle travels to remote locations for care, as well as participates in community health fairs and events. Inspira and CompleteCare have worked since their inception to deliver quality, affordable health care and to break down barriers preventing the access to that care. In addition to locations with extended hours across the Southern Jersey region and innovative approaches to quality care, Inspira and Complete Care are models for health care excellence. The WOW mobile is the latest example of that philosophy and approach. The vehicle will be owned by Gateway and licensed by CompleteCare with Inspira assisting with scheduling and facilitating essential community outreach. The WOW Mobile is a 31-foot-long dental/health office on wheels with slide-outs for additional space. 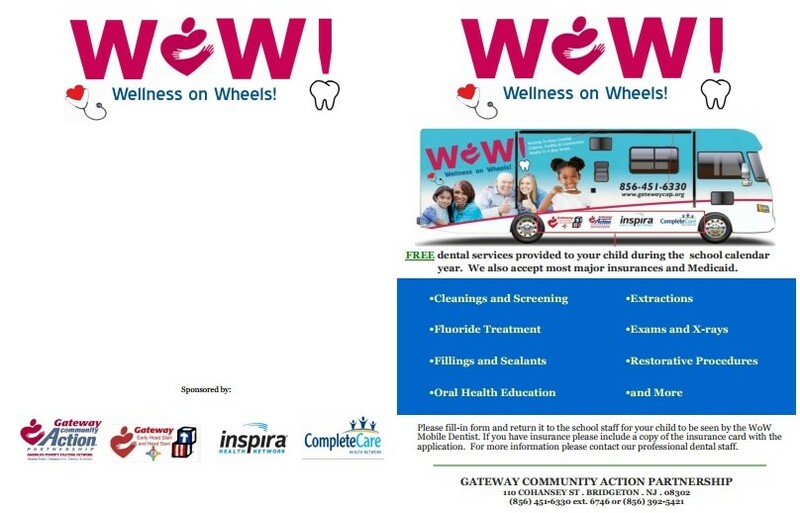 The WOW Mobile is operated by Gateway Community Action Partnership, in partnership with CompleteCare Health Network and Inspira Health Network. Who is eligible to receive dental care in the WOW Mobile? Children who attend participating schools, and Head Start Centers, whether they have insurance or not. If you are in the Expectant Families Program through Head Start you can receive a dental exam regardless of insurance status. If my children attend one of the schools serviced by the WOW Mobile will my children receive free dental care? If your child is insured we will bill your insurance company. If you have a copay this will be waived. If your child does not have insurance you will not be charged. You should receive a flyer by your child’s school asking you of your interest in the WOW Mobile. Shortly after we have received the flyer, you will receive an application packet. This packet includes a letter explaining the program, consent form, health history, patient dental policy form, Client Social Service Tracking Form, Privacy Notice and Patient Rights orm. All forms are to be completed by parents and returned to the school nurse.